Huawei has launched Huawei P20 Lite with 19:9 display, Dual Rear Camera, Vivo V9 also comes with similar Specifications. 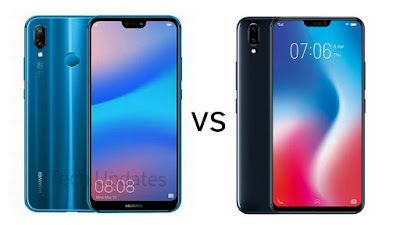 Check out Price, Specs, Features comparison between Huawei P20 Lite and Vivo V9. Both Phones has Dual Rear Camera, Notch Display, Fingerprint Scanner on the Rear. Vivo V9 has Bigger 6.3-inch Display compared to 5.84-inch on Huawei P20 Lite. Vivo V9 comes in Pearl Black, Champagne Gold and Sapphire Blue colors priced at Rs 22,990. Huawei P20 Lite comes in Black, Blue color Priced at Rs 19,999.